Omega-3 Pet offers a liquid supplement that is rich with EPA and DHA omega-3 fatty acids. 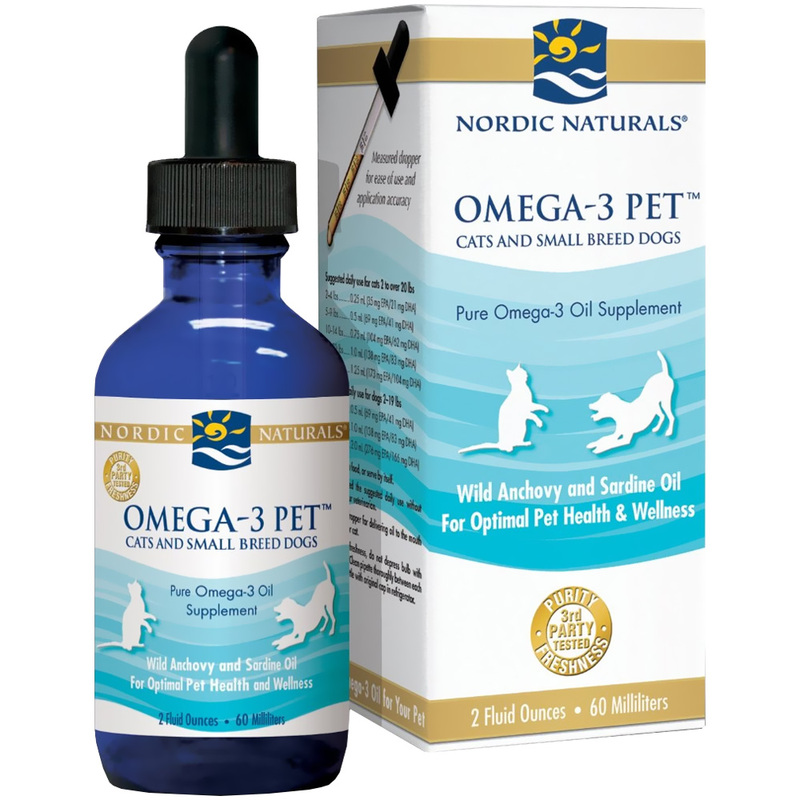 The Omega-3 Pet line was inspired by Nordic Naturals desire to bring the benefits of fish oil to pets. These benefits include helping vital bodily functions such as: cellular health, immune system health, skin and coat health, joint health, heart health, brain development and maintenance, eye development and maintenance. Omega-3 Pet's pure omega oil is derived from anchovies and sardines from the South Pacific Ocean off the coast of Peru. The sardines found in Peruvian fisheries were ranked number one in the world in sustainability during 2008. This easy to feed supplement can be applied to your pet's food, or fed directly to your dog or cat. Fish oil, d-alpha tocopherol (a preservative). No artificial colors or flavors. * Not recognized as an essential nutrient by the AAFCO dog or cat food nutrient profiles. Apply oil onto food, or serve by itself. Do not use dropper for delivering oil to the mouth of your dog or cat. To preserve freshness, do not depress bulb with pipette in the oil. Clean pipette thoroughly between each use. Use within three (3) months after bottle is opened. Store bottle with original cap in refrigerator after opening. Store unopened bottle in a cool, dry place, away from sunlight. My cat no longer has flaky skin! She was very finicky about any other oils I have tried and this one she never turned her nose up at.